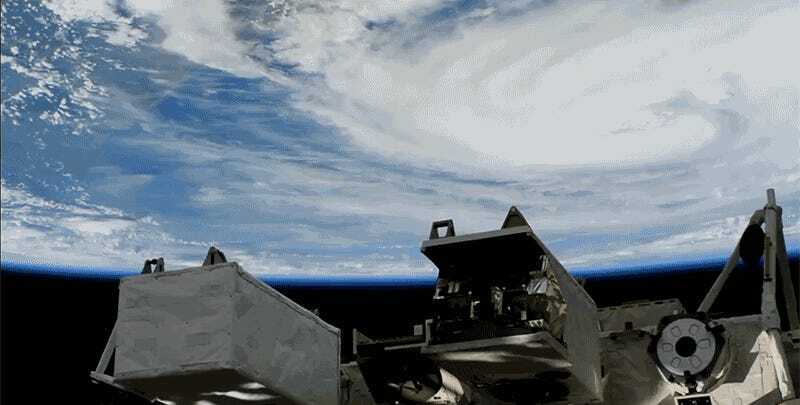 As Hurricane Harvey churns onward toward southwest Texas, astronauts on the International Space Station caught a glimpse of the monster cyclone from a safe viewing distance of 250 miles above the Earth. Honestly, you don’t want to get much closer. NASA astronaut Randy Bresnik also tweeted some photos of the storm taken from the ISS last night, with words of solidarity for Texans in its path. Meanwhile, NOAA’s Hurricane Hunters posted a harrowing time-lapse containing footage from a flight through the eye of the storm yesterday evening. Harvey is now centered 135 miles southeast of Corpus Christi, according to a recent update from the National Hurricane Center. While it isn’t predicted to make landfall until later tonight or early tomorrow morning, tropical storm conditions are expected to reach residents of the middle and upper Texas coast by later this morning. Harvey is expected to be a major (Category 3+) hurricane at landfall, which would make it the first major hurricane landfall in the US since Hurricane Wilma in 2005. A prolific fifteen to 25 inches of rain is predicted top drop up and down the cost, with isolated accumulation totals of up to 35 inches. The NHC warns of “life-threatening” coastal inundation from the storm surge, and urges residents to complete preparations to protect themselves and their property this morning. Widespread evacuation orders were issued along Texas’s Gulf Coast yesterday. As if the threat to coastal residents wasn’t bad enough, Hurricane Harvey’s track could also bring it perilously close to the enormous petroleum refineries encircling Galveston Bay. As Emily Atkin writes in the New Republic, Harvey has the potential to become a major pollution disaster. We’ll be keeping a close eye on the storm, and bringing you updates throughout the day as they arise.